Thank goodness for technology. Once upon a time, wearing a fly fishing wader in warmer weather was akin to stepping into an old fashioned rubber weight-reducing suit. On warm or hot days, an angler wearing the waders of years past would emerge from the stream wet, smelly and steamy on the outside but as dehydrated as a prune on the inside. A Simms G3 Stockingfoot Wader. Top-quality, lightweight and amazingly durable. Thankfully, technology has come along and rescued the fly fisherman from the torture of having to wear rubber and other heavy, non-breathable waders. Today, slipping into waders is often no more uncomfortable than slipping into your favorite pair of pants. Yet, while technology has made advances in fly fishing wader comfort, beginners still often get the wrong type - probably on the unfortunate basis that many new anglers think of waders as a "luxury" and not a "necessity." And so, to prevent beginner anglers from getting the wrong type of waders, I've put together this guide to waders. If you want to spare the reading, I'll also give you a quick recommendation on features to get below. The waders must be breathable. 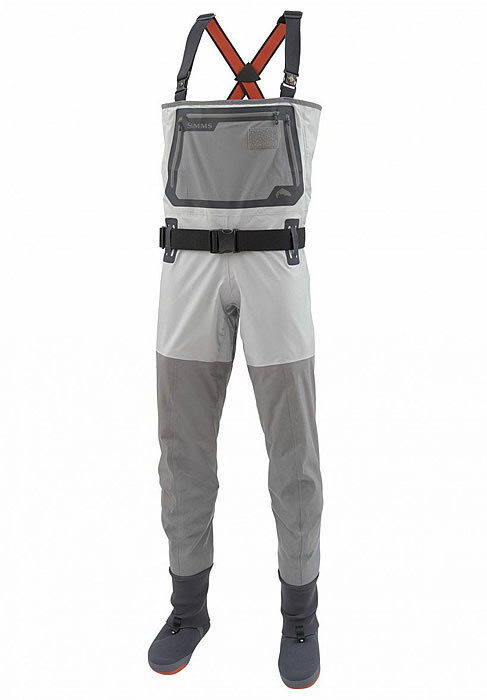 The wader should be constructed of gore-tex, dri-plus or other synthetic material that allows the anglers perspiration to escape from the wader while still preventing outside wader from entering the wader. Breathability of a wader is crucial. Because of this, nylon or rubber waders should be avoided at all times. The wader should be a stockingfoot wader, as they are more versatile than a bootfoot wader. Waders should be as light as possible. If you get a breathable wader, this problem usually, but not always, solves itself. Over the course of a day fishing in the hot summer sun, a light wader is always a good thing. Unless you fish in near-freezing or sub-freezing weather frequently, there is no reason to get an insulated wader. In short - get the lightest, most breathable wader you can find that is made by a reputable manufacturer. Good quality waders are made by Patagonia, Orvis, Cabela's, Simms and Redington, among others. Warm Weather AND Warm Water - When fishing in warm weather and the water is warm, anglers frequently avoid using waders. Indeed, in warm weather where the water is warm, going "wader free" is generally the most enjoyable way to fish unless the angler needs the protection a wader provides (such as to prevent from getting stung by something or to avoid picking up leaches). Fishing in Warm Weather & Shallow, Cold Water (sometimes) - Yes, it is possible to wade fish in colder water if the weather is warm, although the tactic I describe next does limit an anglers flexibility. Here's how to do it. Buy a high-quality wading boot with excellent traction. Also buy quality a pair of quality neoprene wet socks that are thick and designed for very cold water. The use of wet socks are vital for this method to work. What happens is that the neoprene socks trap the water around the foot and keep the feet toasty warm, sort of functioning as a heated sock. I discovered that by keeping my feet warm, I can wade comfortably in cold water (down to around 50 degrees temp) provided I don't wade in water that is deeper than mid-thigh level. If I wade in water deeper than that (waist level), I immediately start to freeze and that isn't much fun - even on a nice, warm, summer day. Needless to say, the air temperature needs to be comfortably warm outside for this tactic to work, too. An Angler Only Float Fishes - If an angler only float fishes (aka...fishes from a boat), there's no reason to buy waders. Since many float anglers do fish from shore at times, to stay warm during that time just use the tactic described above to fish in colder water when the weather is warm. I use this method constantly during the summer months and it works very well. After reading about the three above situations where anglers can avoid using waders, many new anglers might be tempted to "shelve" the idea of buying waders altogether. And you know what, it isn't a terrible idea. However, by forgoing purchasing waders, an angler does limit their flexibility in terms of where they can fish. This is especially so in Montana, where warm days are a bit fleeting and the water is often frigid cold. Even during the summer, most Montana rivers are achingly cold since they are fed from snowmelt and mountain lakes. Still, if an angler doesn't mind limiting their flexibility, the purchase of waders can be avoided...or at least deferred for a while. There are three different types of waders available on the market today. The different types of fishing waders available are the Bootfoot Wader, the Stockingfoot Wader, and the Hip-Wader. Each are detailed below. Bootfoot waders are fly fishing waders that extend from the foot of the angler up to the anglers chest. On these fishing waders, the boot is permanently attached to the wader. Having the boot attached to the wader allows the angler to avoid having to buy separate wading boots. The drawback is that bootfoot waders are heavier in overall weight (since the boot is attached), more bulky, and also somewhat more difficult to get into than other fly fishing wader types. They also lack the ability to take the boot off and use them separately. Stockingfoot waders, by comparison, lack the attached boot found on bootfoot waders. Instead, these waders have a neoprene sock on the foot of the wader. Dedicated wading boots, bought separately, are then put on over this neoprene sock. Like a bootfoot wader, stockingfoot waders extend from the foot of the angler up to the chest, although some varieties now extend only to waist level. Since a boot is not attached to the wader, stockingfoot waders have the advantage of packing up smaller and are lighter - although once you add the weight/bulk of separate wading boots into the equation, the weight and bulk factors are usually more than with bootfoot waders. Stockingfoot waders are also generally easier to get into and out of than bootfoot waders, which is one reason these types of fishing waders are so popular. Stockingfoot waders provide one benefit over bootfoot waders, however. Since the boots are separate, if the conditions are "right" and you can fish without waders - the odds are you still want to use wading boots due to their superb traction. With a bootfoot wader, the angler is out of luck since the boots are permanently affixed. Finally, another advantage of a stockingfoot wader is that since the boots aren't permanently affixed it is a simple matter to upgrade to a different boot should sizes change or the boots develop "problems." Wtih a bootfoot wader, if something is wrong with the boot the entire wader is trashed. Hip-Waders are designed for wading shallow, slower moving waters. These fishing waders - some of which have boots attached and others that do not - extend from the foot of the angler up to the upper leg of the angler. Hip waders are popular for more sedate rivers and fly fishing shallow waters because they are more comfortable than other waders and because they are quite simple to get in and out of. Hip waders can come in handy where you know you'll be fishing very shallow water and the weather is chilly outside (thus making my method of fishing without waders described above not possible). Hip waders also can be used in shallow water if the angler just doesn't want to get wet using a "wader free" fishing method. Wading pants are similar to hip waders. However, they fit more like a "pant" than a "wader." Indeed, they look exactly like a pant and fit just like them, too. 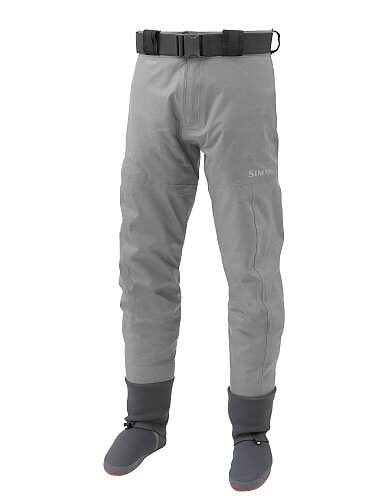 Similar to a hip wader, wading pants are meant for wading shallower water (below waist level). Wading pants are very comfortable and quite light. As such, they are an excellent choice for anglers who know they won't be venturing into deep water. Now that we've covered the three different types of fly fishing waders, it is necessary to look at the different materials/styles of waders available. By styles, we mean what the fishing wader is made out of that keeps the angler dry. Basically, fly fishing waders are made out of two different materials these days - neoprene or specialized breathable fabrics (such as gore-tex or dri-plus). Each are covered separately below. Neoprene waders are primarily used today when fly fishing in colder weather and colder water. The reason neoprene waders excel in these types of circumstances is that different thickness levels of neoprene are available - with the thicker neoprene being ideal for cold weather. Generally, neoprene fishing waders run from having a 3mm thickness (for general warmer weather fly fishing) to a 5mm thickness (ideal for cold water). The problem with neoprene waders, though, is that, like nylon waders, they are not breathable. Thus, during warmer weather, neoprene fishing waders can become quite warm for the angler wearing them. Additionally, since these types of fly fishing waders are not breathable, anglers can get left with condensation in the wader - although the insulating properties of neoprene go a very long way towards keeping the angler warm despite this. Overall, if you plan on fly fishing very cold water or in very cold weather, neoprene waders are an excellent choice. Otherwise, stick with the newer, breathable type of waders. Breathable waders are made out of various compounds, such as Gore-Tex, that are designed to keep the water out while still allowing the anglers body heat and sweat to escape. The result is that an angler wearing breathable waders will stay warm, comfy and generally dry for a full day of fly fishing. 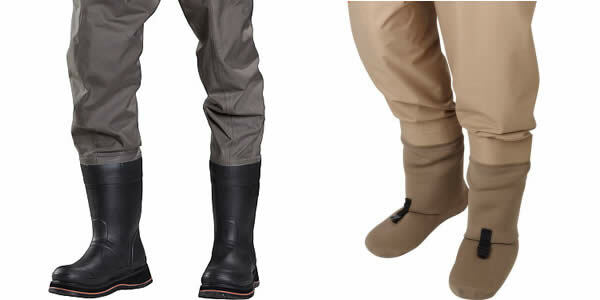 Many different types of materials are now used for breathable fishing waders. These different materials all work extremely well in keeping the water out while still allowing the wader to breathe. Which material you choose in a breathable wader really depends on what is available when you go shopping for them and how much you are willing to spend (gore-tex waders, everything else being equal, do tend to be more expensive than other breathable and waterproof materials, such as dri-plus). Overall, an angler who will be spending lots of time in waders or will be fly fishing in a wide range of environmental conditions, a good pair of breathable waders is an extremely important piece of equipment. While wearing breathable waders, especially if they are fitted correctly, an angler is likely to not even notice they are wearing them since they are so much more comfortable than neoprene waders or the old style rubber or nylon waders. When shopping around for a wader, an angler should look for the lightest wader they can find. Lightweight = Comfortable in the world of waders. Secondly, anglers absolutely should not chance on the quality of a wader. While it isn't necessary to spend $400 on a pair of stockingfoot waders, in the world of waders you truly do get what you pay for. Dirt cheap waders leak constantly and will, eventually, rip apart at the seams. An angler can never go wrong by buying a wader from Patagonia, Orvis, Cabela's & Simms. As for features on waders (such as pockets), that is a personal preference. Same thing for colors, whether an angler gets a lighter or darker color really is up to personal taste. Note that the color of a wader will have zero effect on how effectively you fish. A "camo colored" wader might be just fine for duck hunting, but when fishing for trout - to the trout a "camo wader" is looks no different than a "tan wader" or a "pink wader." Offline, any quality fly shop should have a decent selection of waders although at times certain sizes will be difficult to find. When shopping offline, one suggestion I have, however, is to avoid the waders at Wal-Mart and similar type stores. The waders sold at the big-box stores are generally the lowest quality possible and will quickly develop some leaks, even with tender loving care. Simms - Manufacturers high quality waders. Many of their waders are manufactured in the USA. Company is based in Montana. Patagonia- Has their own brand of very high quality waders in both bootfoot and stockingfoot versions. Fishwest- Sells Orvis, Simms and several other high quality wader brands at excellent prices. Cabela's - Cabela's sells both their own brand of quality waders, along with waders manufactured by Simms, Redington and several other brands. Front Range Angler - Sells high quality waders.